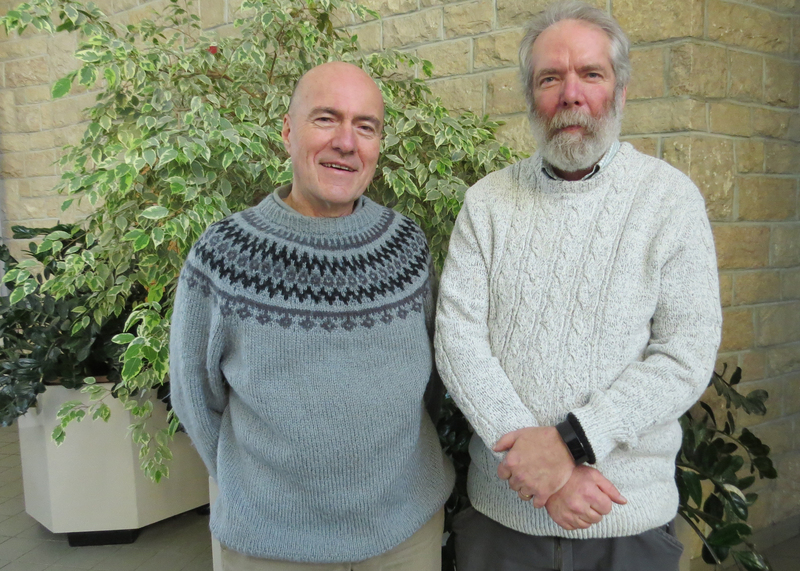 Bob Bors and Rick Sawatzky, fruit breeders with the Department of Plant Sciences, College of Agriculture and Bioresources, are the joint recipients of the prestigious Stevenson Award for their development of sour cherries and haskaps. Inaugurated by the Manitoba Horticultural Association in 1932, it honours individuals who have "made a conspicuous achievement in the field of practical horticulture." Named in memory of A. P. Stevenson, a pioneer Manitoba horticulturist who arrived from Scotland in 1874, it has been given only 21 times in 83 years. As gardeners, we seldom give much thought to their origins as we eat haskaps fresh off the bush or take a cherry pie out of the oven. But it took more than 50 years of breeding and selection work at the University of Saskatchewan before you planted your prairie-hardy cherries and over 20 intensive years went into the development of those haskaps. The first sour cherries planted in the University experimental plots were from seeds from the Central Siberian Botanic Garden in Novosibirsk. These were just beginning to fruit when Rick began work as a technician in 1971. They had low productivity and lacked winter hardiness. Asked to discard them, Rick took two home which he tried (unsuccessfully) to cross with sweet cherries. His goal: to develop a hardy large shrub with large, high quality fruit. Rick crossed the best of these, 'Kerr's Easy Pick', with 'North Star', a sour cherry tree introduced from Minnesota. The result was 'SK Carmine Jewel', the first sour cherry introduced by the University of Saskatchewan in 1999. Bob tested them further, selected the best and developed a protocol for their tissue culture propagation. He gathered additional cherries from local growers and from Ontario and made more crosses. When making selections he looked at flavour, size, pitting ease and the possibility of mechanical harvesting. Bob introduced the Romance series of cherries in 2003: 'Crimson Passion', 'Cupid', 'Juliet', 'Romeo' and 'Valentine.' Of these, Rick's favourite is still 'Carmine Jewel' while Bob's are ‘Romeo’ and ‘Juliette’. Rick's advice on the care of sour cherries: “Grow them as a shrub with multiple stems rather than in tree form." Bob concurs and adds: "Keep the soil around cherries weed-free." Haskaps have gone through many incarnations in terms of their names. They've been called blue honeysuckle, sweetberry honeysuckle, and honeyberries. The earliest Canadian selections were made by George Bugnet, a French novelist and early plant breeder who homesteaded west of Legal, Alberta in 1905 and who is better known for his roses. Bugnet's honeysuckles were a beginning, but their taste, size and texture left much to be desired. Breeding at the University of Saskatchewan began soon after Rick Sawatzky came across what were then called honeyberries (Lonicera caerulea edulis) in 1997 in an article by Jim Gilbert in a Minnesota fruit magazine, Berryland News in 1997. He ordered 2 each of 4 honeyberry cultivars from a nursery in Oregon. Rick was in the preliminary testing mode when Bob Bors joined the Department and tasted them in the summer of 2000 when he and Rick were giving a field tour to growers. It was June and they were already ripe. Both Bob and the growers became very excited. (Bob has yet to calm down). The following year crosses were made among the four varieties. By 2003, thirty-three named Russian haskaps had been obtained from multiple sources. In 2004, Bob heard a talk on haskaps by Dr. Maxine Thompson at a conference. He visited her breeding program and she gave him many seeds and cuttings of Japanese haskaps to use in his breeding. That was a double whammy. Haskaps had him. Over the next decade, Bob made trips to Japan, Poland, and across Canada gathering an enormous collection of wild and cultivated haskaps. As well, he continued to obtain seed from various sources, especially Russia. Maxine Thompson had referred to them as haskaps: the phonetic spelling of the word used by the Ainu people who settled Hokkaido, Japan in the 13th century and the world’s oldest name for this berry. Bob followed her nomenclature and haskaps they've become. “We had stock from Dr. Thompson from Oregon State University and from Japan as well as seeds from Russia. Once they were in the plots I selected what was worth crossing. There were many from which to choose and they ripened at different times." Among the early and mid-season haskaps released in 2007 were 'Borealis', 'Tundra' and the Indigo series ('Indigo Gem', 'Indigo Treat' and 'Indigo Yum'). 'Aurora' and 'Honey Bee' followed in 2011. Later ripening haskap releases were 'Boreal Beauty' and 'Boreal Blizzard' in 2014 and 'Boreal Beast' in 2016. Of these, Bob's favourite are 'Aurora' and the Boreal series. The next step was introducing the new dwarf sour cherries (and later the haskaps) to commercial fruit growers and the nursery trades. Thousands of open-pollinated plants were sold through Western Producer ads and dozens of clonally propagated selections were distributed free to carefully chosen co-operators. Bob became the consummate marketer and publicist of both cherries and haskaps, writing a growers manual (with Linda Matthews), giving many talks and courses, leading plot tours, posting articles on the Fruit Program's web site (www.fruit.usask.ca) which gets 2 million hits per year, and taking cherries and haskaps with him for folks to taste wherever he went. Once people became aware of their existence, both fruits became very popular. Haskap research has been funded through five Saskatchewan Agriculture grants spanning 13 years. Over the last five years (2013-2018, 75% of the program funding has come from plant patent royalties derived from their introductions. Plant sales directly to the public, held annually in early June since 2005, workshop registration fees and cherry and haskap cookbook sales have also funded their research. Bob wishes other breeding programs would replicate the University of Saskatchewan's style. "Many of them still operate in a traditional manner – they exclude the general public. We’re the opposite. We welcome the so-called “backyard gardener’, hand out materials, and have an annual plant sale. Grassroots connections with the general public are crucial and should not be underestimated". Rick feels his greatest accomplishment was simply keeping the fruit program going at times when few others in the Department were interested. He loved his work on fruit during the 47 years he was with the University and that love continues into his retirement. He believes good apples and great pears are only one generation away. Bob's greatest accomplishment has been "the expansion of the haskap program. We took something that did not exist and brought it forward to the point where the University of Saskatchewan has the world's best haskap breeding program. Our haskaps taste better, ripen later and stay on the bush longer before falling off. As well, we were the first to use mechanical harvesters. We have given birth to a whole new industry." As well as the cherry and haskap breeding, we have continued to breed and maintain a diverse collection of over a dozen far north fruit crops in what we call the “Prairie Fruit Gene bank”.